The Russian woman arrested on charges of being a foreign agent had ties to Russian intelligence operatives and was in contact with them while in the United States, federal prosecutors said Wednesday. In a new court filing, prosecutors said Butina, who has connections with wealthy business executives linked to the Putin administration, appeared to have plans to flee the United States. 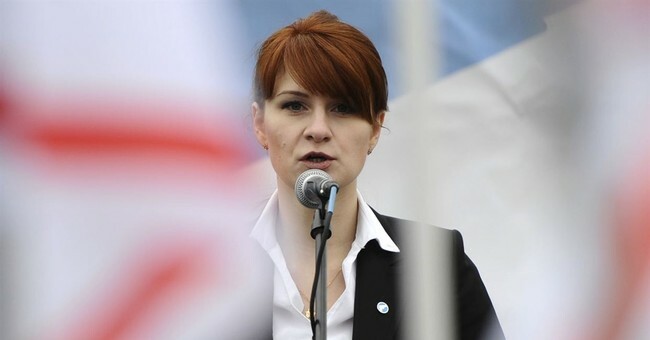 Butina was arrested on a criminal complaint Sunday, and federal authorities indicted her Tuesday for conspiracy to act as an agent of a foreign government and failing to register as an agent of a foreign government. She is scheduled for a detention hearing Wednesday afternoon on whether to release her from jail before trial, and prosecutors filed a motion this morning outlining why she should be held without bond. Re TASS photo of Trump/Lavrov meeting - woman in the doorway of the Oval is an NSC staffer, NOT Butina. It would be a pretty big deal if it turned out there was a photo of that Russian agent in the White House, and an even bigger deal if it were the Oval Office with President Donald Trump, and a huge red siren big deal if she were in the Oval Office on the very week former FBI Director James Comey was fired. And that’s exactly what Mic reporter Emily Singer reported on Twitter on Tuesday. Only she was flat wrong. Only that isn’t so. That’s not her. The Daily Beast‘s Lachlan Markay first heard from the White House that it might be Cari Lutkins, a White House staffer, who was actually pictured. The photo was still going around, though, and Buzzfeed’s Tom Namako confirmed that it was event planning Lutkins in the Oval Office and not Russian operative and federal detainee Butina. And liberal media figures wonder why they’re mocked and not trusted anymore.